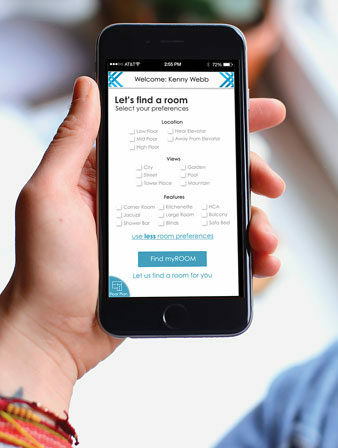 Koridor’s MyRoom platform lets guests pick their guestroom. ATLANTA—When it comes to marketing a hotel, owners, operators and brands are very good about highlighting special features—an Arnold Palmer Golf Course, a celebrity-chef restaurant, a rooftop pool—but one area of the hotel that isn’t always optimally displayed is one the guest spends quite a bit of time in: the guestroom. Allowing guests to explore and choose their rooms ahead of time so they can select a space tailored to individual preferences, can not only improve the guest experience, but it can enable properties to increase revenue. This is the driving force behind Koridor, a hospitality technology company, and its MyRoom platform. MyRoom enables hotels to market rooms more effectively and curates features using dynamic content and analytics; guests are able to self-select their rooms, upgrade or choose features that best suit their preferences. When a reservation is made, Koridor creates a qualified list and sends those guests a link that includes information and imagery about the rooms and floor plans to help them decide. Hotels can set parameters regarding who gets the link—for example, do all guests receive it or only loyalty members?—and when that link is sent out, as well as when it shuts off. From Hall’s perspective, this will enable hotels to better market personalized rooms to guests, including upgrades—thereby affecting ROI. “The real opportunity is how this application can present an upgrade opportunity to me in the right way that reflects my price for that upgrade on that day,” he said. Through research the company conducted with Cornell, it’s discovered that people have a greater tendency to upgrade when it’s at their own pace, then they do when offered the opportunity in person at the front desk. “When people go to order McDonald’s through a kiosk, they’re five times more likely to supersize fries than at a counter,” Hall said. Of course, like with any technology, the data piece is important and will enable hotels to better market their properties to guests. “The problem that has plagued this industry is these islands of automation, pockets of data, or the lack of deep integration,” Hall said. “Personalizing this through the use of CRM data and being able to take things that we know about you and serve up a recommendation to you is really where the next level should be. We’ve talked to a lot of the CRM guys on how this could happen. We think, ultimately, this is where this should go.” The goal is to make it so that when guests go to select their room, the hotels can offer up top choices based on information it knows about the guest—whether they prefer a shower or a tub, a high or low floor, a room far from the elevator, or one that offers a balcony, for instance. Right now, the name of the game for Koridor is accumulating data—and not just about the guest. “We have 10 properties in various stages of pilots today,” Hall said. “What we did is pursue a cross section of the industry—we have high-end luxury properties, center-city convention hotels, small resorts, boutique properties. We want to take this data and start to analyze it.” This will enable the company to see what types of hotels this platform works best for, as well as what types of guests choose to use it and how they use it.